Black Friday is typically a special day to go shopping. For drift fans, however, it was a special day to watch some spectacular drifts done by champion drift drivers. On that day, Hoonigan and Nissan flocked to the abandoned Hawthorne Mall near Los Angeles to perform some awe-inspiring drifts that left fans mesmerized. Through Hoonigan's "Black Friday" and Nissan's "Black Friday 360 Experience, people witnessed the drifting performances of two-time Formula Drift Champion Chris Forsberg and Ryan Tuerck in their 1000 hp Nissan 370Z's. In particular, the Black Friday 360 Experience had some scary yet amazing moments. Likewise, a 360-degree camera rig was run over after a minor blunder had a prop suddenly flying in an unexpected direction. 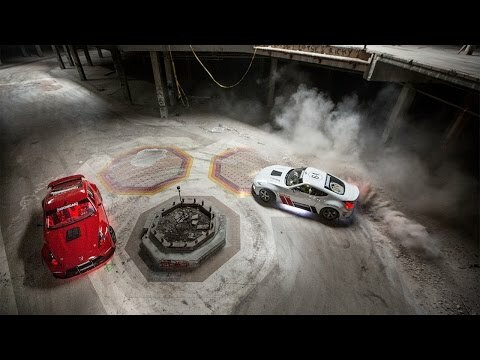 However, the team and their many cameras still managed to capture astonishing moves and stunts, just like when Forsberg and Tuerck glided through the mall site wheel-to-wheel in close formation. For a full glimpse of the "Black Friday 360 Experience," the video can be seen on Nissan YouTube and Facebook channels. Drifting fans like mall crowds on Black Friday about as much as fish like fresh air. To commiserate with the fans, Hoonigan and Nissan joined forces to take over the abandoned Hawthorne Mall near Los Angeles, and celebrate Black Friday in their own unique way. With the creators of the Gymkhana and Recoil video series calling the shots, two-time Formula Drift Champion Chris Forsberg and Ryan Tuerck push their 1000hp Nissan 370Z's to the edge in Hoonigan's "Black Friday" and Nissan's "Black Friday 360 Experience." Black Friday 360 Experience puts fans in the middle of tire-smoking action for stunts that even left the pro drivers stunned. In one scene, driver Chris Forsberg swerves the back of his car on the ledge of a 30-foot drop. "I knew I could mentally block out the drop, however my biggest concern was the surface," admitted Forsberg. "The conditions were dusty and underneath all of that was polished concrete. We had one chance to get the shot before the rubber built up." A rubber buildup actually adds traction that would compromise the control of the car when drifting. The shoot was not without its challenges. Years of dust at the site required the crew to use respirators to breathe as the roar of Nissan power echoed in the ghostly halls of a once bustling mall. The scrappy production team was never afraid to try anything, even at the expense of a few cameras in the process. In one instance, as the white 370Z explodes through a wall, a GoPro was left implanted in the cinderblock facade. Another time the revolutionary 360-degree camera rig was run over when a slight miscalculation sent a prop flying in an unexpected direction. The bevvy of cameras capture the powerful Nissans and talented drivers and yield breathtaking results. Forsberg and Tuerck glide through the mall site wheel to wheel in close formation, like fighter pilots staging a smoky dogfight to the glorious soundtrack of revving engines and burning rubber.